When the roll is called for fighters who are the greatest boxers of all time, not to be forgotten are those behind their success, such as the personality that sold their storylines, bringing them and what they are capable of to our awareness. One of such individuals is the American boxing promoter, Don King. He is famous for his involvement in historic boxing matchups as much as he is notorious for always finding himself mired in the most difficult of controversies. As a professional in selling the storylines of fighters and trying to make fights, King promoted historic events such as The Rumble in the Jungle, Thrilla in Manila, as well as some of the greatest boxers of all time including Muhammad Ali, Joe Frazier, Sugar Ray Leonard, Mike Tyson, George Foreman, Larry Holmes, Evander Holyfield, among others. The veteran promoter was born Donald King on 20th August 1931 in Cleveland Ohio, the USA, to Hattie and Clarence King. He attended Jonh Adam High in Ohio and graduated in 1951 after which he enrolled at Kent State University. King dropped out of college and ran an illegal bookmaking operation which would see him facing the law for killing two people. In 1954, King shot and killed one Hillary Brown while he was attempting to rob one of his gambling houses. He was cleared of the incident after it was ruled a justifiable homicide. However, 13 years later, he was convicted of second-degree murder and sentenced to prison for beating an employee named Sam Garrett who owed him $600 to death. He served for nearly four years and was paroled in 1971. Don was later granted full pardon by the Ohio Governor, Jim Rhodes in 1983. Following his pardon, Don King entered the business of boxing, forming a partnership with a local promoter, he garnered experience in the art of boxing promotion. In 1972, with the help of singer Lloyd Price, he convinced Ali to compete in a charity exhibition to raise money for a Cleveland hospital. Two years later, he became a full-time promoter with the much-anticipated 1974 Ali-Foreman bout in Zaire famed as The Rumble in the Jungle in which Ali regained his championship title. Since then, his image has hovered over professional boxing. Don King went on to stage seven of Ali’s fight including one with Chuck Wepner in 1975, which Ali won in the final seconds. It was reported that Sylvester Stallone saw the fight and was inspired to write the award-winning Rocky. That was followed by another epoch-making bout, the Philippine Thrilla in Manila, the fight between Ali and Frazier in 1975. The match which was considered the greatest match ever further solidified Don King’s future as a promoter. Through the ’70s, he became the choice promoter of many other premier heavyweight championships into the 1980s and 1990s. Additionally, he compiled an impressive roster of pugilists in the decade, many of whom went on to become Hall of Famers such as Roberto Durán. In the following decades, many others including Mike Tyson, Evander Holyfield, Leon Spinks, Bernard Hopkins, Ricardo López, Félix Trinidad, and Terry Norris chose him to be their fight promoter. Nevertheless, a number of them including Ali, Larry Holmes, and Tyson felt defrauded by King and filed lawsuits against him, most of which were settled out of court. 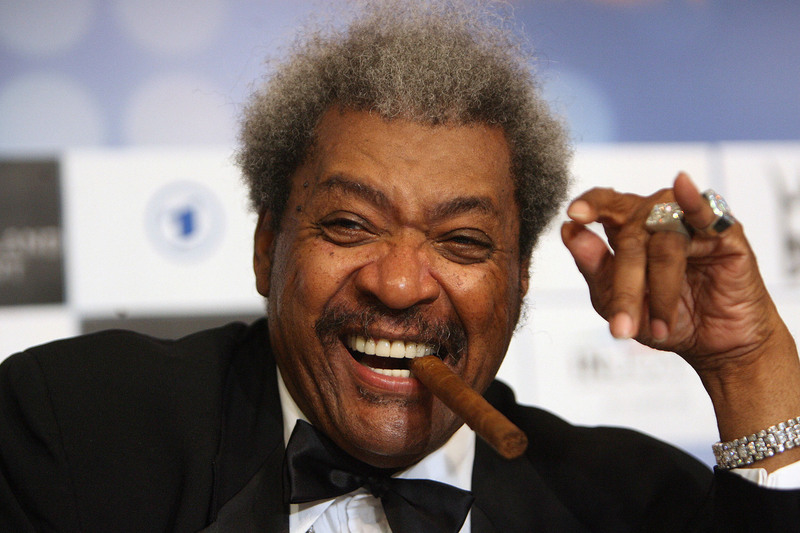 Controversial as his career has been, Don King is still adjudged as one of the greatest boxing promoters ever. So far, he has promoted more than 500 world championships fights as well as over 100 boxers. In 1997, he was inducted into the International Boxing Hall of Fame and was elected to the Gaming Hall of Fame in 2008. Although his legal problems and controversial tactics have reinforced the public perception of boxing as a corrupt sport, he would always be remembered for creatively promoting boxing. Apart from boxing, King is politically active. In 2004, he campaigned for George W. Bush in the presidential election and attended the Republican National Convention in New York. Moreover, he supported Bush’s successor, Barack Obama in both the 2008 and 2012 presidential elections. Disregarding his political endeavors, he managed Michael Jackson‘s reunion, The Jacksons’ 1984 Victory Tour and ventured into media publication. He bought Call and Post, a Cleveland-based weekly newspaper serving the African-American community in Ohio in 1998 and still serves as its publisher as of 2011. Don King worked with Donald Trump in the ’80s to promote Tyson’s title fights and years later, when the latter ran the race to occupy the highest office in the nation, his old friend, King was there to endorse him for president. King married his wife Henrietta in 1959 and they had three children; one biological daughter named Debbie, and two adopted sons, Carl and Eric. He credits her as the force behind whatever success he has accomplished in life and calls her his best friend. After a prolonged illness and almost fifty years of marriage, Henrietta died on December 2, 2010, at the age of 87. Don King garnered a lot of attention for various reasons besides boxing, one of which is his signature gravity-defying hair, and the other, his catchphrase – Only in America. Another point of interest in the life of the promoter is the size of his wealth. During his heydays, King built his empire by launching the careers of boxing luminaries and managing lucrative fighting championships. However, his financial deals and bizarre contractual terms with his fighters left a number of people unpaid and unsure where the money went. As such, his fame, as well as his purse, grew to a point where it left some of the various heavyweight champions he has promoted in his shadow. He has a net worth estimated at $150 million.